The FIER bullets stem from several years of research thanks to which the best in each sector has been reached, namely hunting and security. 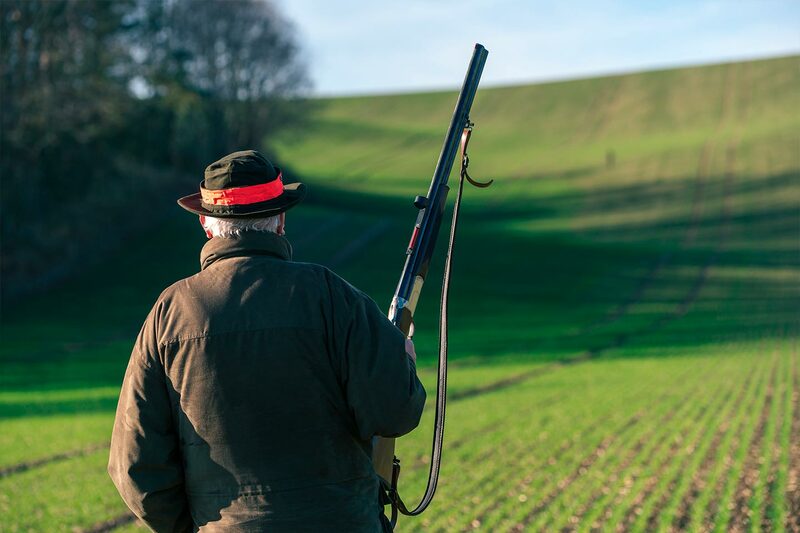 For hunters, their precision is an important asset, their superior wound power can stop any type of game and their design secures the shots by reducing the ricochets. The FIER bullets are available here in 12, 16 and 20 gauge. For the security forces, according to the model, they will perfectly meet the needs (penetration, neutralisation, defence) while reducing the dangerousness significantly beyond the useful firing range. FIER Ammunition is a company specialized in studying, designing, manufacturing and selling ammunitions destined to hunting, law enforcement and security agencies. Beginning of 2016, it has acquired FIER projectiles again which stem from over 25 years of research and development of which the innovative concepts are still protected by several patents. 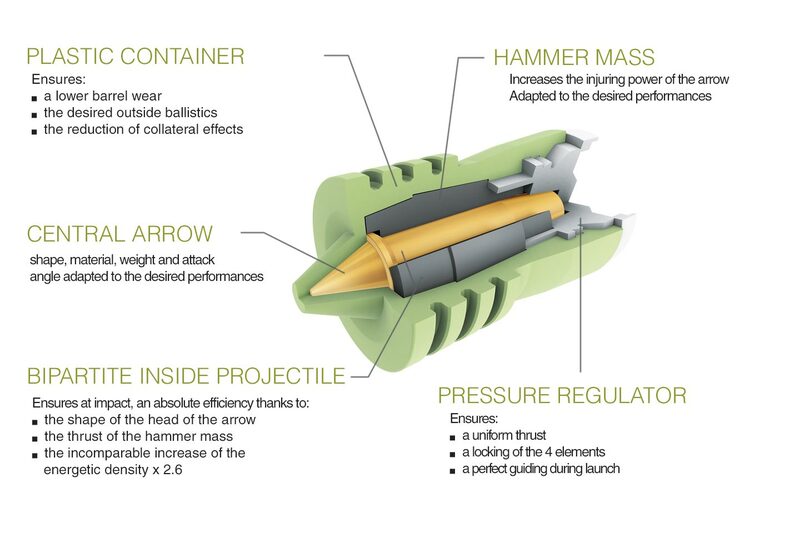 The pasted investments have allowed to design a range of unparalleled technical projectiles meeting multiple needs. FIER Ammunition is continuing its research to improve their performance and efficiency relentlessly according to new technologies. is its flexibility within the different contexts of use. Each projectile has been studied according to a specific need. It is possible evolve to meet new specific conditions, while preserving the common external features (precision, reduction of dangerous firing range and ricochet risk). 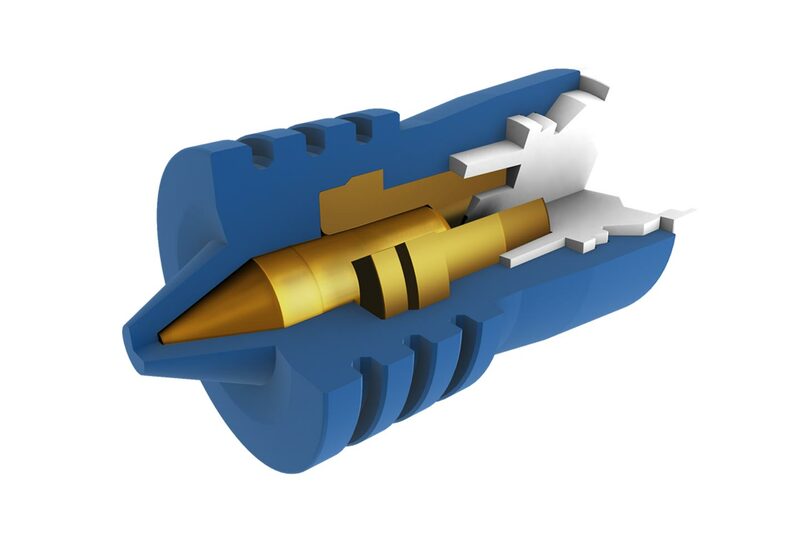 The core principle of the FIER Ammunition projectiles is the one of a bipartite, sub-calibrated and double effect projectile, placed in a plastic container, that is itself locked by a pressure regulator. Its specificity, for a sub-calibrated projectile, is to remain as a single compact projectile along its trajectory. There is no separation at the end of the barrel. The release of the internal bipartite projectile only occurs at impact. This principle and this specificity provide hight qualities to the projectile, including a double-effect. This effect, which ensures a better penetration in the target, is due to the composition of the internal projectile released during impact made of an arrow (element of penetration) and a hammer. These two elements will act together or individually according to the type of target reached. The shapes and materials of those two elements will offer multiple action benefits during impact. In 20 gauge the projectile is of single effect composed of a unique arrow-material. By remaining compact on its trajectory. with its head shape that makes it fall to a maximum range of 200/250 metres (for horizontal shot, shoulder-fired shot, level surface shot). with the significant reduction of ricochets, according to the tip of the arrow, to the shape of the container, to its grooves, allowing to hook the target even for a tangential shot. Thanks to the combination of a heavy central mass, and a light outer casing. Thanks to a high and regular speed. 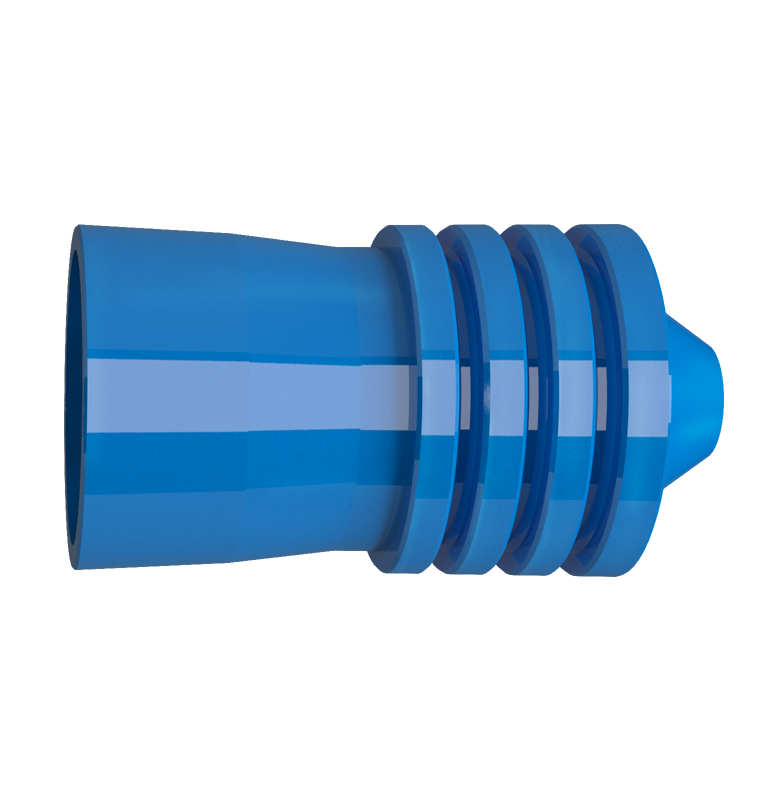 Thanks to the automatic adjustment at the boring of the barrel, which provides a good precision in all barrel chokes. Thanks to an initial hight velocity. 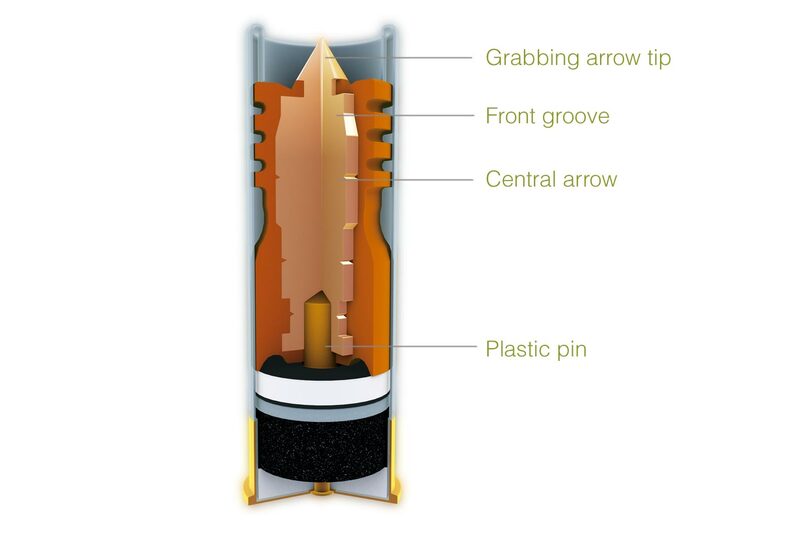 Thanks to the instant energy released by the hammer mass on the arrow that acts as a power amplifier during impact. The combination of various materials and shapes meets the desired usages according to effects, actions or different ranges required. 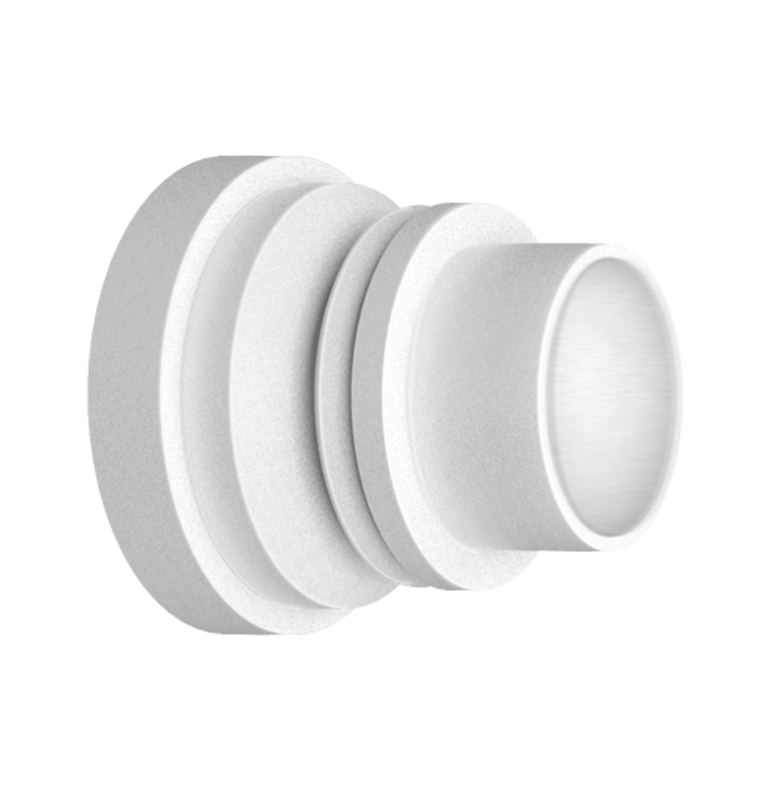 The bipartite design allows to reduce the quantity of lead, 16g maximum on one of both components. Thanks to the total substitution of lead in certain models while maintaining an impressive efficiency. 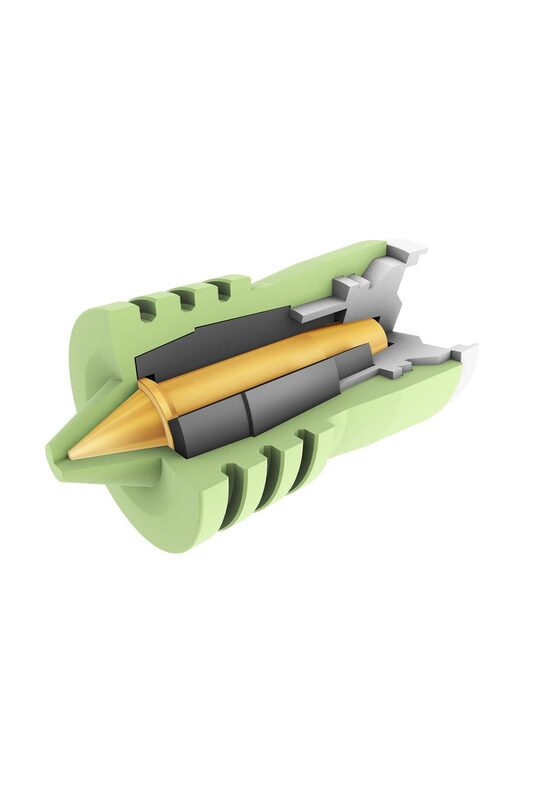 The FIER Ammunition bullet is composed of the following parts (except 20 gauge and MSTDF) : : a container, a central arrow, a hammer and a pressure regulator. The container and the pressure regulator are in plastic, the arrows and the hammer can be in lead, brass, steel, aluminium or any other material, depending on the desired effects. In 20 gauge, the container and the pressure regulator are a single part. 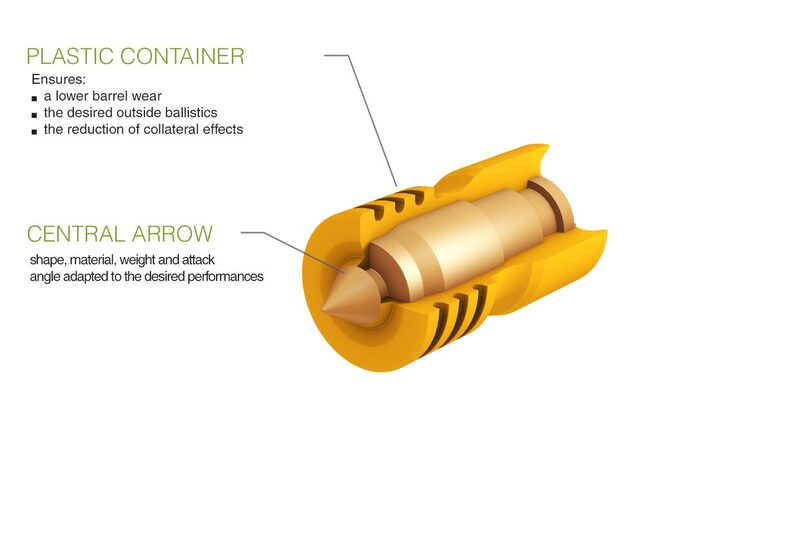 The container ensures the aerodynamic stability of the projectile and ensures its high precision at impact. It allows a subtle passage of all the chokes. Moreover, it avoids the barrel wear and leading. At impact, the bipartite inside projectile is released, letting the arrow and the hammer through. The inside chimney of the container guides the active projectile, thus reducing the ricochet. The shape of the central arrow favours : Target hooking, penetration in all shooting circumstances, deep penetration in hard zone, ricochet risk reduction. The hammer propels the central arrow and expands in soft zones. At impact, it amplifies the energy that it disseminates in the target. The pressure regulator ensures : a perfect gas tightness of the powder , a uniform thrust, a constant speed, a perfectly guided projectile. High speeds going from 410 to 540 m/s according to the models. Projectiles that remain united throughout their aerial trajectory. A release of the inside projectile only at impact. The kinetic energy of the inside projectile multiplied by 2.6 at impact. This double effect is obtained thanks to the composition of the released inside projectile at impact. It works as a shock dart. The central arrow and the mass cause a high neutralizing power effect. Both parts with different materials act together or individually according to the resistance of the touched target. 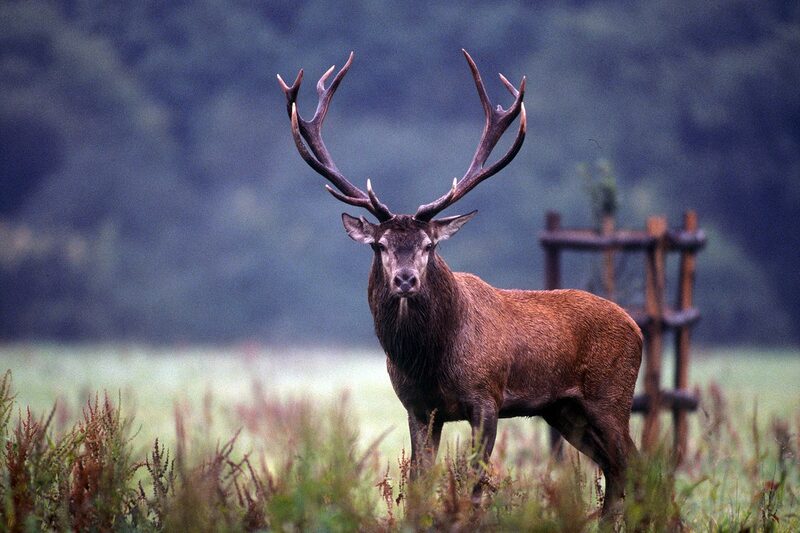 The hunting range of the FIER bullets meets the expectations of the most demanding hunters. It meets all the hunter's needs in the three usual smooth gauges 12, 16 and 20 and also in magnum reloading 12 and 20. 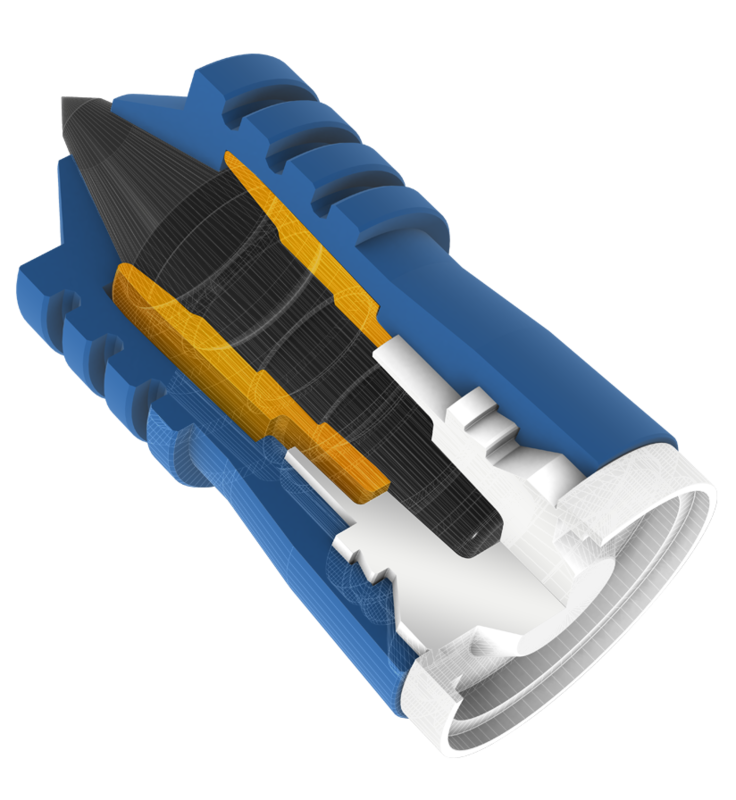 It is suitable for smooth or rifled barrels. 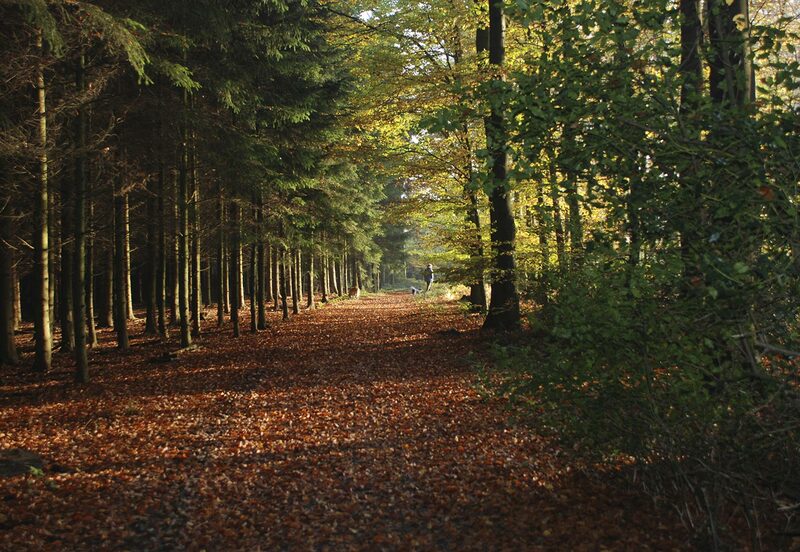 Find the range in gun shops, specialised outlets and on Internet. Produced in France. The FIER Classic is the most flexible of the range. Its heavy hammer produces a powerful shock effect, the central arrow acts as a penetrator, with a dense alloy, it continues its trajectory up to the deepest vital organs going through the bones if it meets any. 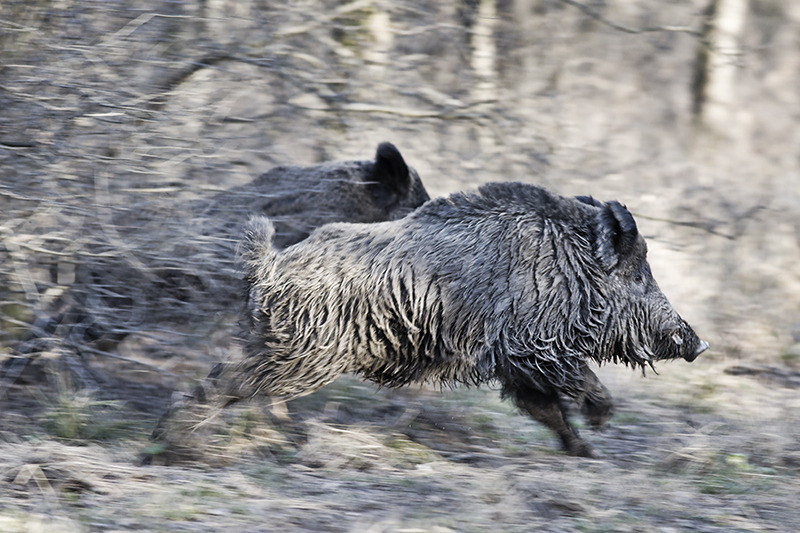 Deer / Wild boar / Stag from 0 to 50 m.
For deer, wild boars and stags at distances going up to 50 m. At the root of the whole range, it is undoubtedly the most flexible and the best way to discover the FIER projectiles range. Neutralising power by optimising the energy via a double effect at impact : deep penetration of the central arrow, strong expansion of the mobile hammer in tender zone. Excellent hanging in the target even in case of tangential shot to the front or the back, which leads to a ricochet risk reduction. Moderate pressure and passage without damage in the chokes (from smooth to full choke). No leading of the barrels. High quality French design, production and manufacturing. In compliance with the CIP standards. It is the most flexible of the range. 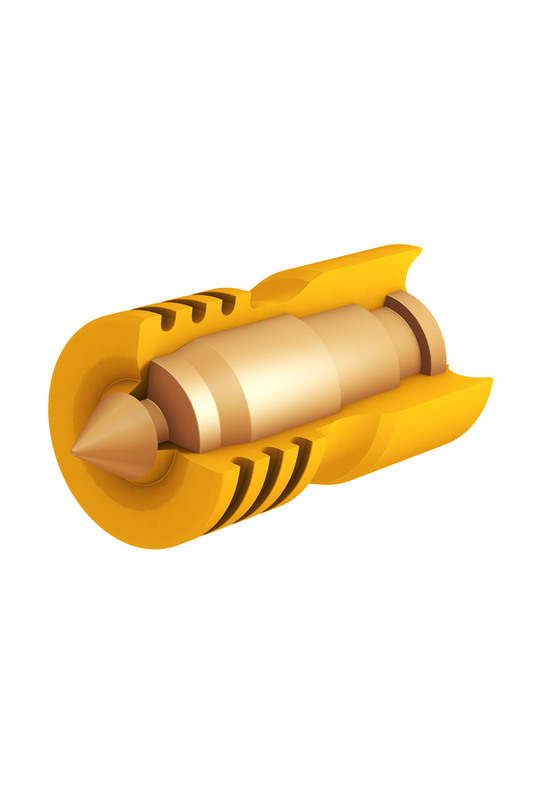 Its heavy lead hammer produces a powerful shock effect, the central arrow acts as a penetrator, with a dense brass alloy, it continues its trajectory up to the deepest vital organs going through the bones if it meets any. Identical features to the previous but adapted to 16 gauge. 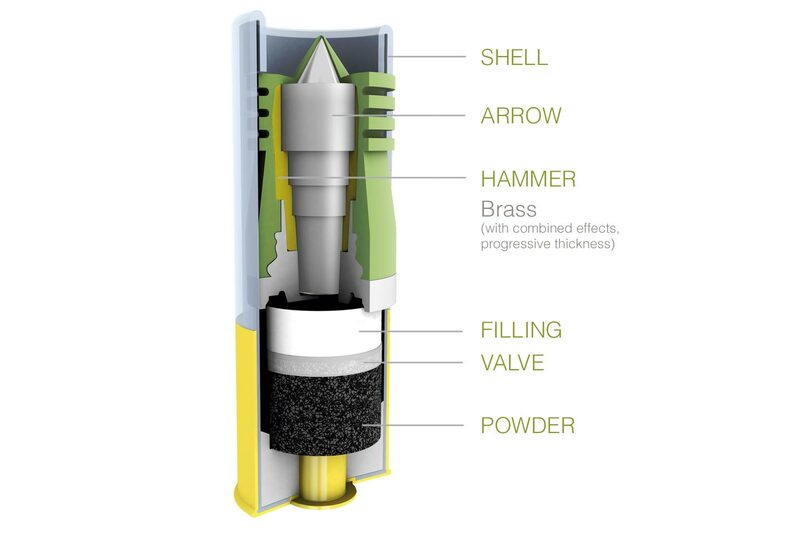 At impact, the deep penetration of the arrow and the particular expansion of the hammer mass ensure the total release of energy with a high stopping power and an incredible efficient lesional action. 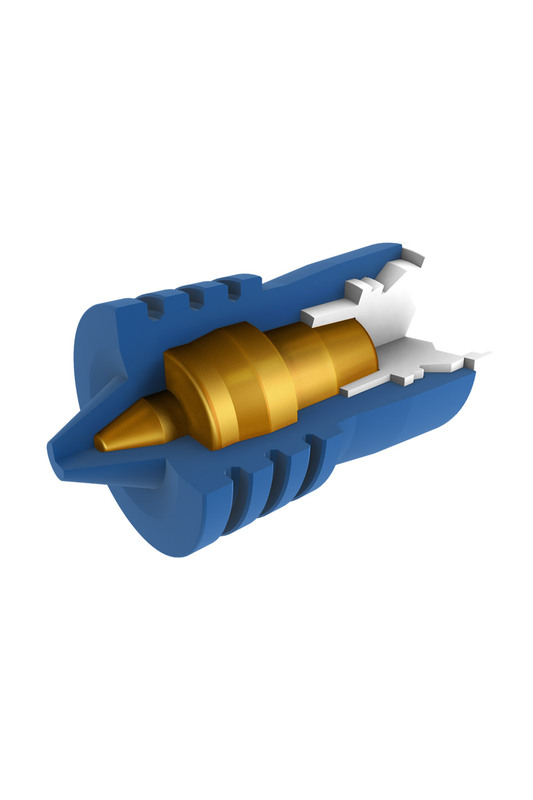 Wild boar / Deer from 0 to 50 m.
For Wild Boars and Deer up to 50 m. The inside projectile is bipartite, composed of a heavy lead arrow with successive thrusts on which slides a brass hammer mass. At impact, the deep penetration of the arrow and the particular expansion of the hammer mass ensure the total release of energy with a high stopping power and an incredible efficient lesional action. This projectile exists in 12x70 and 12x76 for higher power and a shot up to 70 m. This projectile also exists with a brass arrow, ensuring a total respect of the environment. 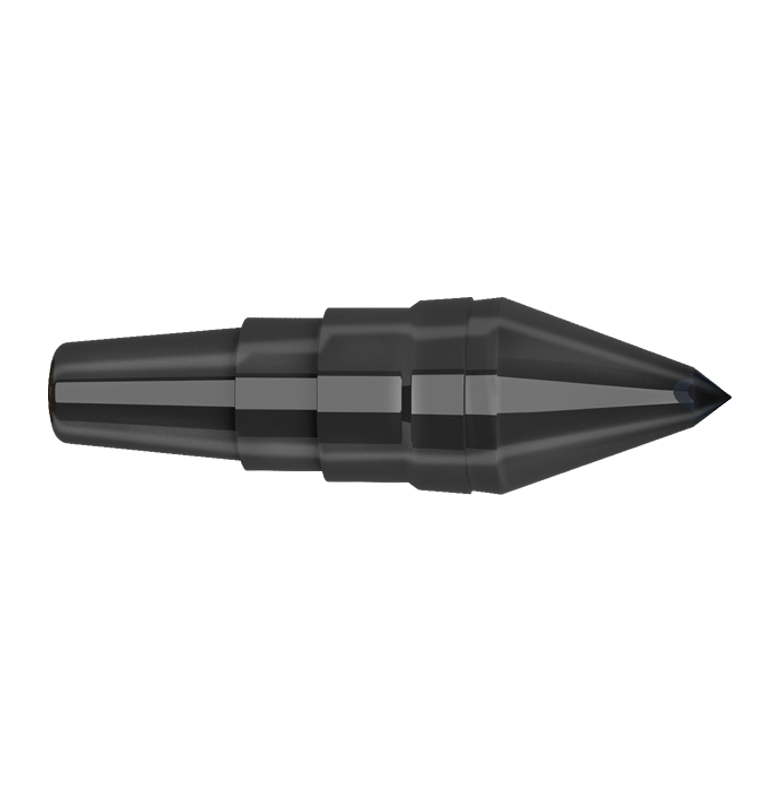 In 20 gauge, the particular design of the FIER bullet with the combined arrow and hammer gives excellent results for any game. The bullet is lead-less thus environment friendly. 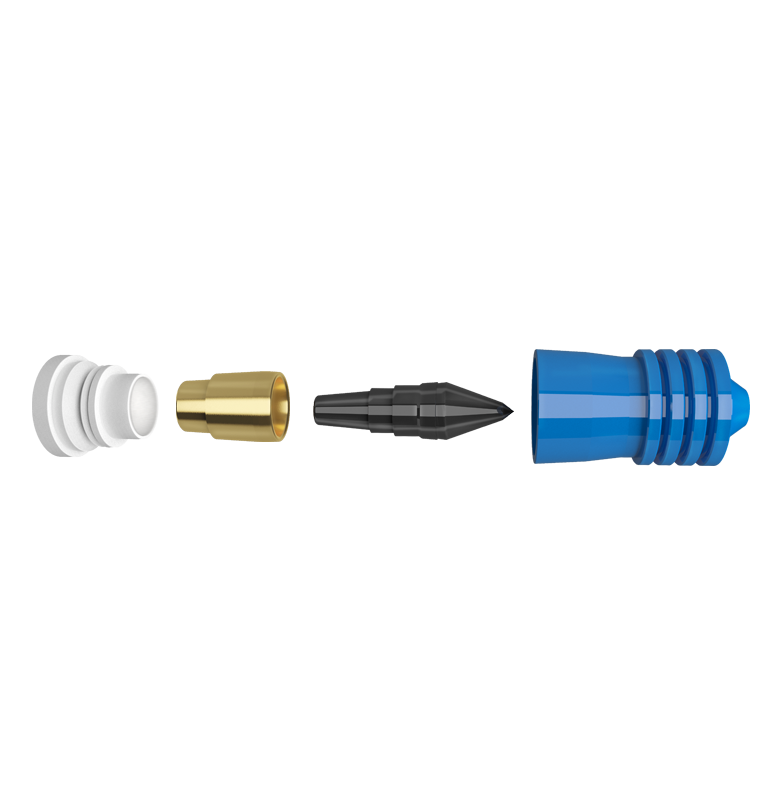 Deer / Wild boar/ Stag from 0 to 40 m.
For Deer, Wild Boars and Stags up to 40 m. The FIER Nature 20 gauge is a lead-less projectile, composed of a brass arrow covered with plastic, the dimensions and shapes have been optimised in order to get the best gauge while preserving the features of the FIER bullet (precision, penetration...). At impact, there is a deep penetration of the brass arrow/hammer, up to the deepest vital organs, going through the bones if it comes across any. 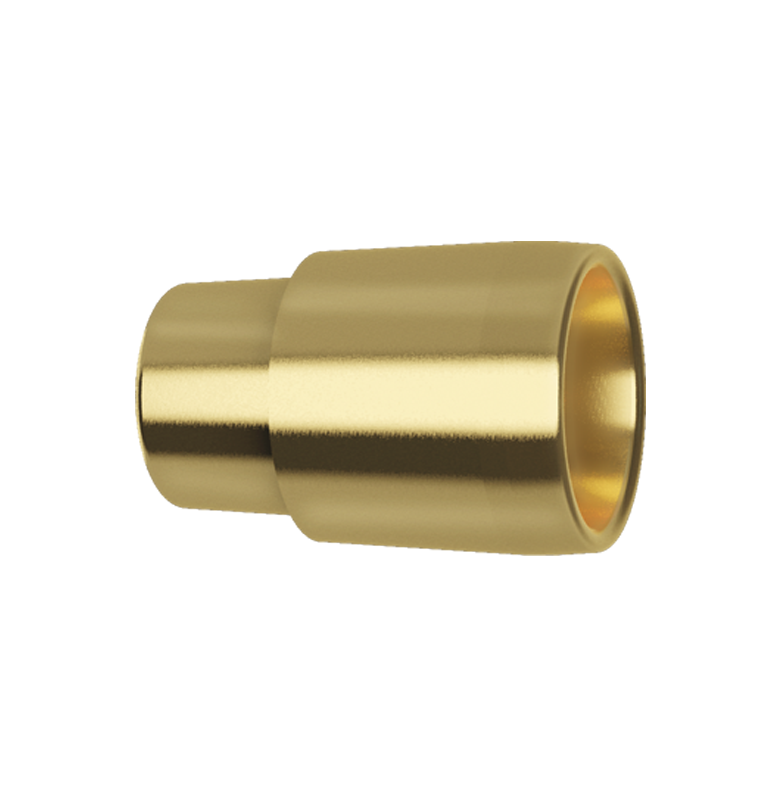 This projectiles exists in 20x70 and 20x76, completely in plastic and brass ensuring it is environment friendly. The Magnum version allows a shot up to 60m. 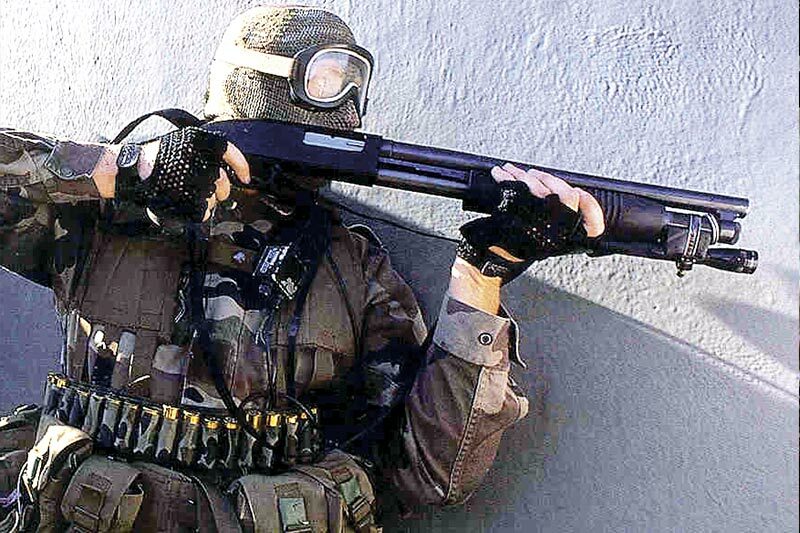 The FIER Training, in 12 gauge only, is particularly suitable for practicing. It takes the general characteristics of the FIER Classic, while having a mass of only 20 grams. This gives a greater shooting comfort during the shooting sessions. It has a very nice price. 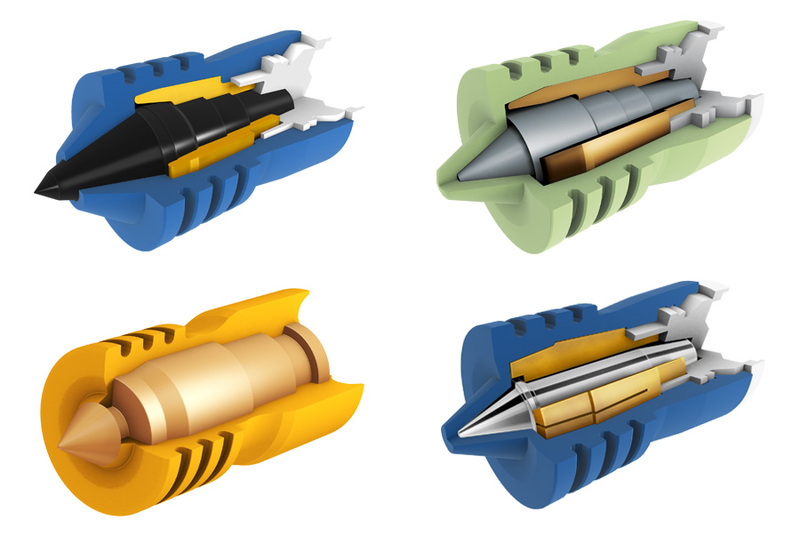 The police force range of the FIER bullets solve several issues of the security forces and are destined only for them. More detailed information will be provided on demand to any authorized person. The FIER bullet range for the police forces is adapted to the 12x70 2"3/4 or 12x76 3" gauge weapons (Magnum), pump-action shotgun or semiautomatic type with smooth or rifled bore barrels. 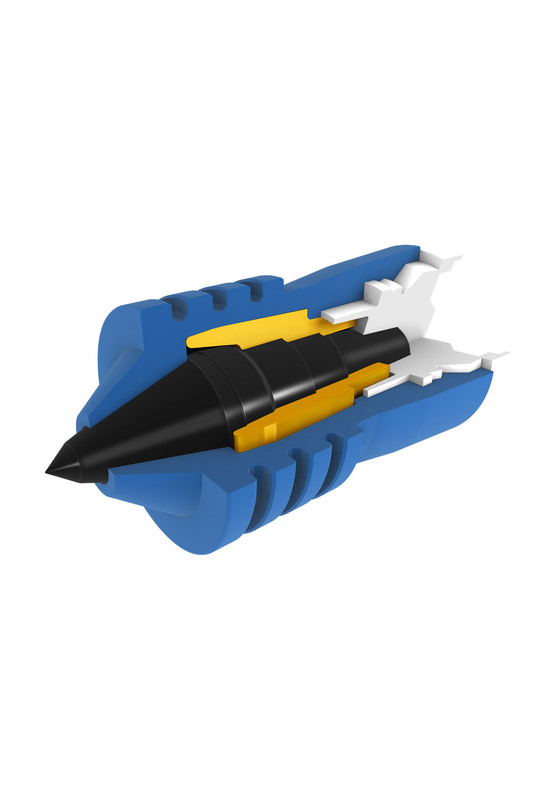 The projectiles have a high speed between 415 and 540 m/s and remain united throughout their aerial trajectory. The release of the internal projectile only occurs when it touches a hard body. Of a perfect adaptation of the back part of the projectile to the barrel during the shot. In the final part of its trajectory, the inside projectile can not be released from the container during an unforeseen impact due to insufficient energy. It then behaves like a mono-block projectile of which the frontal section is 275 mm2. The projectile undergoes considerable braking, leading to a significant reduction in range. In 12 gauge only for pump-action shotgun or semiautomatic. This projectile meets a double imperative : Behaviour differentiated according to the resistance of the target (soft or hard), limitation of the dangerous effects beyond an average distance. In the case of a soft target, an individual without protection, the projectile, at 25 meters, penetrates completely over around 10 cm. In the case of a hard target, the type 2 ballistic protections of an individual are pierced and the individual neutralized at 25 m. The projectile is no longer lethal beyond 150 m.
Limitation of dangerous effects beyond an average distance. 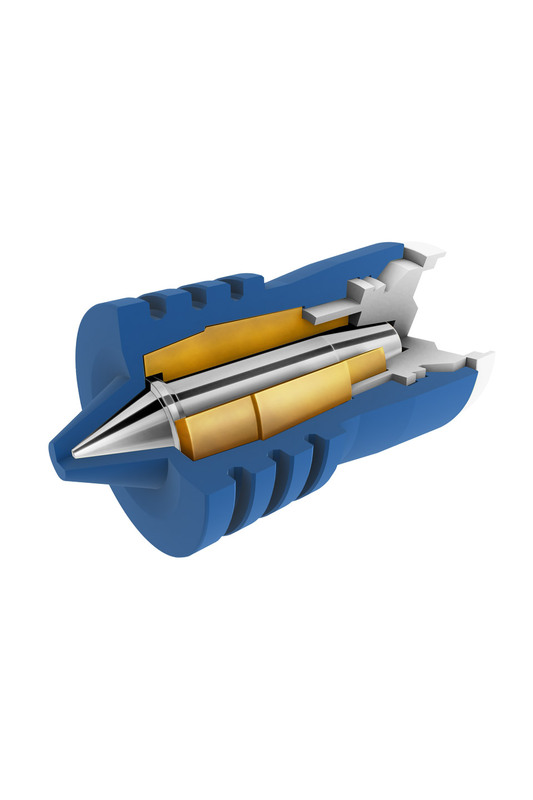 If the impacted zone has a higher hardness, the plastic shell releases the metal dart, which, using the pulse of the hammer mass, perforates the hard part. The tests revealed that up to 35 meters PAL can neutralize an individual wearing a Class II bulletproof vest. At the same distance against an unprotected individual, the bullet enters the body without exiting. 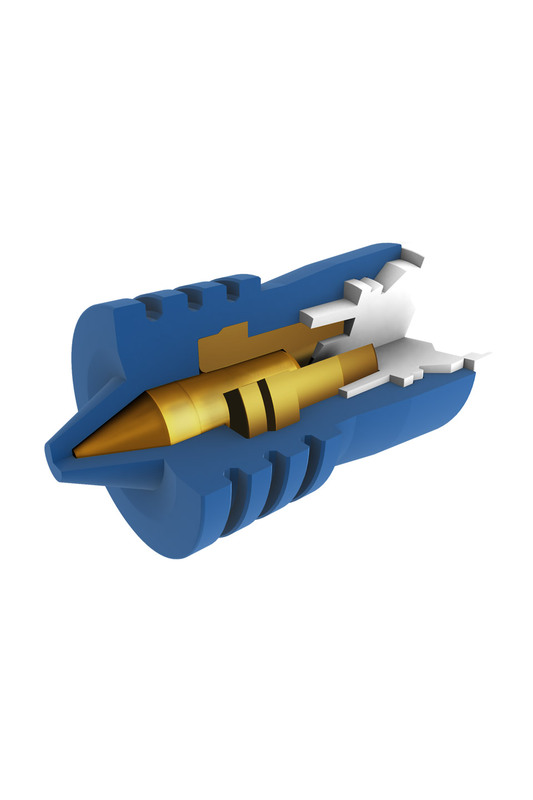 With an initial velocity of 410 to 420 m/s, a recoil below 60% of a conventional ammunition, the effective range is below 80 m, the dangerous aspect being lost beyond 150 m. The incapacitation realized on an individual with this projectile is strictly limited to the necessities of neutralization of a dangerous individual unlike the other bullets of the market which are made for hunting and of which the target is to cause multiple lesions in order to give a rapid death. The risks of ricochets are very significantly reduced. The use of this ammunition makes it possible, to a large extent, to avoid collateral effects. 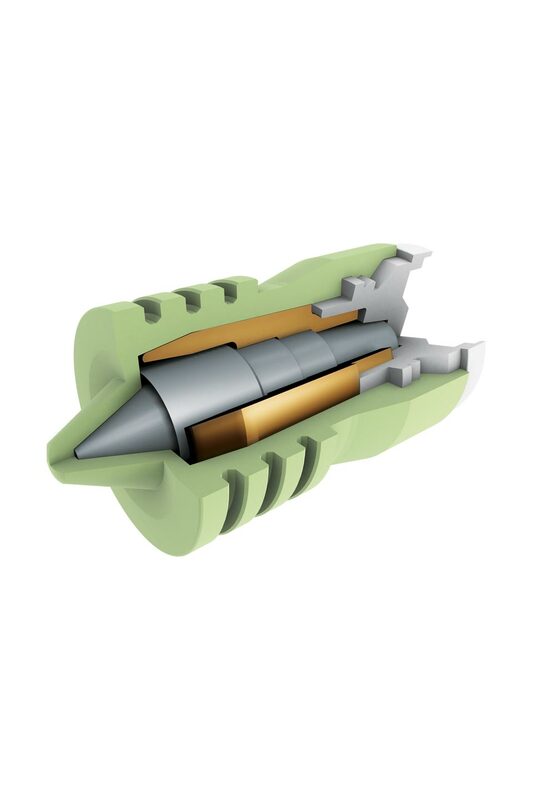 This ammunition is particularly suitable for use in urban areas. It complies with the Hague conventions. Lead-less. The moderate weight of this projectile generates a very small recoil of the weapon during the shot which, by taking away the shooter's apprehension, increases the safety of use. Tested and approved by the French Ministry of the Interior. Adaptation of the projectile PAL to the specific conditions for the cash transport in armoured vans. By making the arrow of the hammer united, the penetration of the personal protections is reduced, ensuring the safety of the conveyors in the case where weapons are used. Specially developed to fight against protected targets at medium distance or in urban environment. Excellent perforation of personal ballistic protections and metal screens. High dispersion of kinetic energy and optimization of the momentum transmission in soft materials. It is a variation of the MSFA projectile with greater lesional power, the hammer separating in a controlled manner into 4 petals at impact. This projectile meets a double imperative : strong penetration coefficient, including shielding, limiting dangerous effects beyond an average distance. Depending on the reloading, the features can go up to: Anti-personnel effect without ballistic protection: 150 m; Anti-personnel effect behind class II bulletproof vest: 70 m; Perforating effect: 11 mm perforation of steel at a distance of 12.5 m; Sub lethal at 250m. For any commercial and technical information on our products or their use.